In a world that gave birth to seven Saw movies and roughly 47 iterations of The Fast and the Furious, we should have seen this coming. 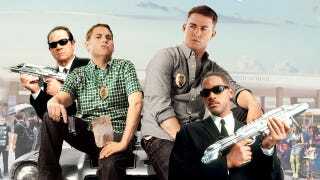 According to leaked Sony exec emails, a Jump Street/Men in Black crossover will be playing in movie theaters everywhere this summer. God help us all. No, not 23 Jump Street like we all thought, but MIB Jump Street. This is a real thing. A real thing that very powerful people want to make happen and are willing to pay millions of actual, legal American dollars for. Jonah Hill could not be more thrilled. But don't think that this is all Jonah Hill's nightmarish fever dream, Sony is all in. Amy Pascal, Sony Pictures co-chairman, is apparently fulfilling her life's dreams. Hannah Minghella, President of Production at Columbia Pictures under Sony, added, "There is nothing I want to do more than make this movie... beyond exciting..." Much in the way, one would imagine, that a kooky, unwanted house guest or a stroke might be exciting. According to Pascal, Sony is apparently hoping to have the film ready to go sometime in July. And they are going to do their damndest to make it happen, with Pascal writing at one point that she "will green light this movie without a script and a target budget number tomorrow." Sure, why not. While no one saw this particular bizarre crossover coming, it really shouldn't be that much of a surprise. Sony's biggest films come from old ideas in shiny packages. But then, so do its biggest flops. Besides, who needs to take the risk when there are an infinite number of sure things. For instance, how about a Matrix/Flubber crossover? Or a Baby Geniuses/There Will Be Blood crossover? And there's plenty more where that came from, Sony. We'll be waiting for your call.